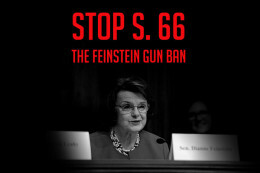 "Take Action: Stop the Feinstein Gun Ban (S. 66) - Contact Congress!" Take Action: Stop the Feinstein Gun Ban (S. 66) - Contact Congress! Cosponsored by Sens. Chris Murphy (D-Conn.) and Richard Blumenthal (D-Conn.), the "Assault Weapons Ban of 2019" aims to "ban the sale, transfer, manufacture and importation of military-style assault weapons and high-capacity ammunition magazines." Ban bump-fire stocks and other devices that allow semi-automatic weapons to fire at fully automatic rates. Require that grandfathered assault weapons are stored using a secure gun storage or safety device like a trigger lock. Prohibit the transfer of high-capacity ammunition magazines. Ban assault pistol stabilizing braces that transform assault pistols into assault rifles by allowing the shooter to shoulder the weapon and fire more accurately. Ban Thordsen-type grips and stocks that are designed to evade a ban on assault weapons. The Feinstein Gun Ban would also ban 205 specific firearms by name as well any firearm that "accepts a detachable ammunition magazine and has one or more military characteristics including a pistol grip, a forward grip, a barrel shroud, a threaded barrel or a folding or telescoping stock." TAKE ACTION RIGHT AWAY AND CONTACT YOUR U.S. SENATORS AND HOUSE MEMBER ON THIS! DEMAND THAT THEY OPPOSE S.66 & DEFEND GUN RIGHTS!